Inspired by an explosion of springtime blossoms, I sought to capture in “Wisteria Reflections” the beauty and elegance of cascading wisteria blossoms. For several weeks in April and May, these graceful flowers hang from their tree branches, often far above the ground in breathtaking clusters. 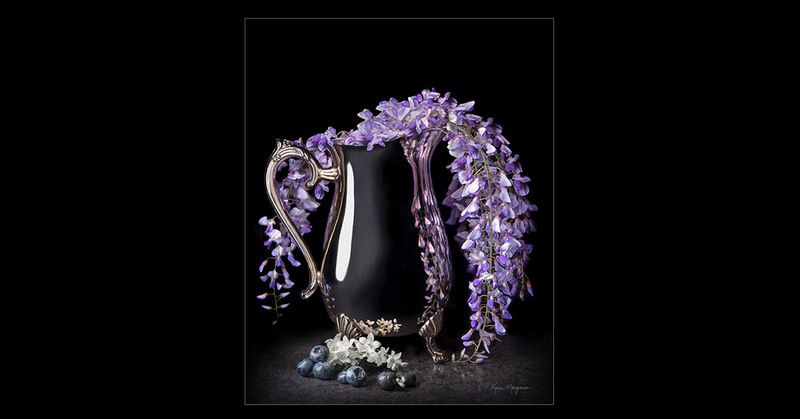 To photograph them, I initially hung them in my studio from various structures, but ultimately chose to drape them from this reflective, silver pitcher to show their sensuous curves and distorted reflections. The blueberries in the foreground are in keeping with my most recent work, which incorporates food subjects into the compositions.